Mid sized hot water pressure cleaner with the extra performance of 3 phase power supply. 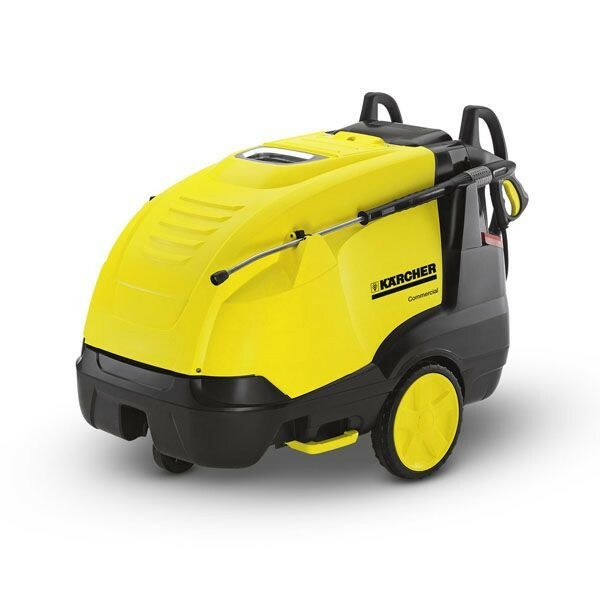 Kärcher’s HDS 10/20-4 M is a superb, high performance hot water and steam high-pressure cleaner with class-leading performance and economy. With innovative new features such as the ECO mode, offering fuel savings of up to 20% without compromising cleaning performance, the 10/20 provides our customers with the toughness, cleaning power, and low running costs they demand. • 4-pole, water-cooled electric motor with long-life bearings. • 3 piston axial pump with ceramic pistons. • Machine protector chemical system to protect against limescale/black water. • 3-year heater coil warranty (when RM 110 or 111 machine protector chemical is used). • Simple, user friendly control panel with LED warning and service display. • Service switch to accurately meter machine protector chemical and call up service information. • ECO mode offering 20% fuel savings over previous models and full water flow at 60°C.• New layout offering easy access to all service components and improved mobility. • Pivoting 1050mm stainless steel spray lance. • Easy Press trigger gun prevents operator fatigue over long operating periods. • Low fuel cut-out facility. • Motor protection switch to protect against overload.